In most parts of the country, just as you start to feel a little chill in the air, that's when we like to start quilting and working on those holiday projects! Good News! We have a collection that has you covered from autumn through December. This collection consists of 10 Halloween designs, 10 Autumn designs and last but least, 25 Christmas designs, all of which come in multiple sizes for a total of 135 designs. Create everything from quilts, to simple embellishments on place mats, napkins or holiday stockings. 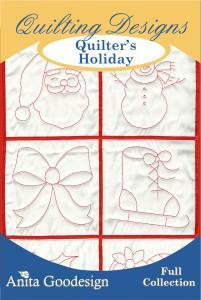 What better way to enjoy the changing of the seasons than with your Quilters Holiday collection!